Another superb season from JeQuan Lewis shadowed the development of rising senior Jonathan Williams; as a junior, Williams made phenomenal strides in multiple aspects of his game. Now tasked with fulfilling the role of starting point guard, Williams’ sophomore-junior development has proved he’s ready. Going from 3.9 to 8.3 points per game in only 10 extra minutes of playing time is evidence of his improvement. He more than doubled his point production while only increasing his playing time by about 70%. Not to mention, Williams emerged as the team’s 2nd best distributor behind JeQuan Lewis, and he even had a better assist-to-turnover ratio than the polished senior. Williams was more frequently utilized as a shooting guard than a point guard last year, but this season should grant him much more time at the 1. Rhoades has good reason to trust Williams at the helm. It’s also worth noting that Jonathan Williams improved his defense — big time. He went from committing 4.7 fouls per 40 minutes in A-10 play his sophomore season to just 2.1 his junior year. In the 2016-17 conference season, the junior became the 7th best in the Atlantic 10 in regards to this metric. Again, Williams was better in this category than Lewis was, giving plenty of optimism towards Williams’ ability to serve as a replacement. 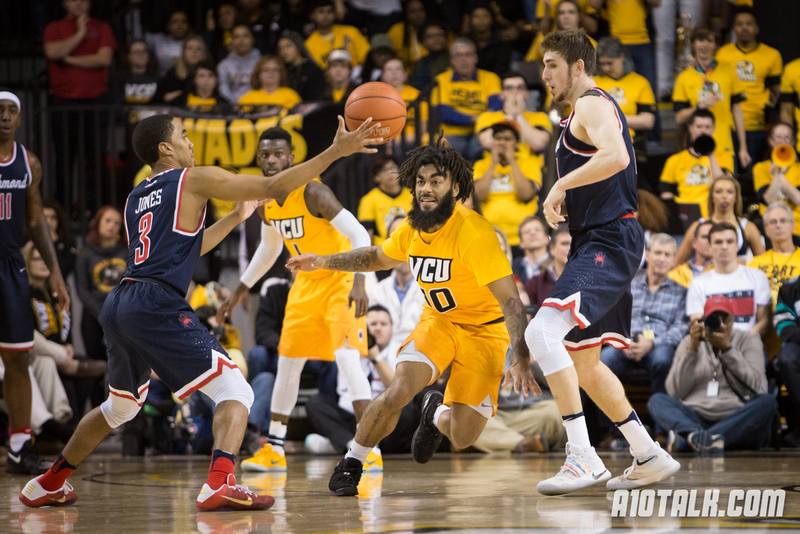 While he’s still yet to develop much of an outside game, Williams is a traditional point guard who makes scrappy plays on defense and gets through the lane on offense. His improvements last year were understated, and he looks like he’s ready to come out in a big way in his final season with the Rams. There’s been quite a bit of talk about the “Big 3” in Hawk Hill — Shavar Newkirk, Lamarr Kimble, and Charlie Brown will be a lethal combination when on the floor together. But let’s not forget about the guy who carried the injured Hawks through some tough games last year. Demery was forced to evolve into a scorer — scratch that — a playmaker. The 2016-17 season forced him to emerge into a less passive role, and he was the guy taking a majority of the shots for Phil Martelli. His 19 points helped Saint Joseph’s win at Duquesne last year; he went 10/15 from the field and dropped 27 on Fordham as well. I’m not saying James Demery is going to be an explosive, all-conference type player this year, but I am saying that he’ll be more important than you think. A Murphy’s Law type season for Saint Joseph’s made Demery into an integral piece to this program, and having a player that has the ability to drop 27 points is an enormous asset. Due to injury, Nathan Ekwu never had a chance to take off his junior year. This was unfortunate for the Wildcats who lacked that true presence down low all of last season. They certainly had (and still have) size in Peyton Aldridge and Will Magarity, but neither player spent significant time working as a traditional post. Subsequently, Davidson’s bigs found themselves positioned around the perimeter, and the Wildcats ranked 296th nationally and 12th in the Atlantic 10 in offensive rebounding percentage. Now cue Nathan Ekwu. As a sophomore, he had the 5th best offensive rebounding percentage in the conference and had 6 games with at least 4 boards on the offensive end. He served as an enormous catalyst for second chance points, and that was without earning all that much playing time. Last year, Ekwu was more than limited, but this year could be a different story. If Davidson looks to utilize its best rebounder on both ends of the floor, it will have a lot more opportunities to score. I like a completely healthy Ekwu to take a big step up this season. Demery is going to be key this year. He will probably come off the bench in a similar role as Aaron brown in their 2016 A10 championship run. I'd agree 100%. A core 5 of Newkirk, Brown, Kimble, Demery, and Lodge looks incredibly dangerous.